It’s fascinating to read articles on the internet about the invention of the stapler. There aren’t that many of them. Within a short space of time, if you do this, you’ll see that these articles are mostly copying from each other and simply reworded to make it seem like it’s new information being passed-on. But it isn’t. The worst part of it is that much of the information out there is flat-out wrong. A French king using a stapler? Really? That’s as believable as Steve Jobs refusing to work with anything but a typewriter. Staplers have a long history, but their beginnings were in construction, not in paperwork management – royal or otherwise. The patent that the Novelty Paper Fastener was based on was for use in constructing fences, not fastening papers, for example. However, before long it became apparent that staples would be a good and inexpensive way to permanently fasten papers together. But even this idea came about more as part of a greater “technology/business war” than years of research and development. If we go back to just the 1860’s and 1870’s you’ll see paper pinning machines, the introduction of McGill’s brass paper fasteners, and office eyelet machines. All of these made money, and they all had their strengths but they also had their weaknesses. Enter the (in)famous George W. McGill. McGill was already famous and well-off from his brass paper fasteners and his various paper fastener punches and presses. And in 1878 he introduces his Single-Stroke Staple Press, later to be called the Staple Press No 1. Novelty Paper Fastener first advertised in 1880, patented 1880. Now George McGill was not only an inventor, but he was a successful businessman. And he was also an attorney by trade – a patent attorney to be exact. And George McGill was quickly unhappy with all of the competition he suddenly had for his very successful Staple Press. The earliest, and most successful, of his competitors was the Novelty Paper Fastener. 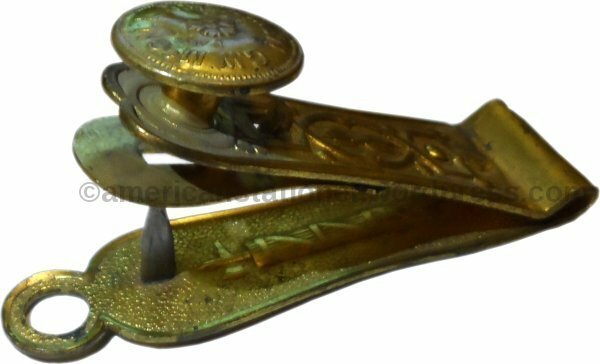 While this item held patents from 1880 and later, Philadelphia Novelty Company also held similar stapler patents from 1877 and earlier. This detail ends up being very important. Despite these details there then began an over two year bare-knuckle battle of the then major stapler manufacturers. Now, McGill was no amateur and at the same time he was taking legal actions here in the U.S. he was also taking action in the U.K. On March 10 it was reported in the U.S. that McGill had brought action to restrain the sale of the Novelty Paper Fastener in English Chancery Court. But in the U.K. there were plenty of shenanigans to go along with the legal proceedings. For example it was reported in the London Times in February how one newspaper was taken to court over the erroneous and false report that the Chancery Court had essentially pre-decided the case! When the Master of the Rolls decided on this particular issue he was quite clear how this article was both morally and legally wrong. In November of 1881 the Philadelphia Novelty Company started running full-page ads that essentially stated that all other staplers, including McGill’s Staple Press, was in fact an infringement on their patents! During the first year that this was going on there was some scare tactics by McGill that targeted customers and sellers of the Novelty. But by January 1882 things started getting especially ugly when a story was “planted” that an export agency for the Philadelphia Novelty Company had surrendered and cancelled their agency on account of the ongoing legal issues. Very quickly afterwards Philadelphia Novelty Company answered stating that the export agency in question did not surrender their agency due to legal issues, and that it had been shown in court that the patents in question did not infringe. After this decision the public seems to have lost interest as this issue is no longer reported on. While these kinds of bully tactics were fairly common at this time it didn’t end up effecting sales of either the Novelty or of the Single Stroke Staple Press. McGill’s Staple Press was first advertised in 1878 but was still for sale as late as 1913. While it was likely for sale for a short time after that it was at that point an obsolete technology. There were plenty of choices and most of them could load more than one staple at a time. The McGill Single Stroke Staple Press No 1 weighs 2 lb 10 oz and measures 6.25″ L x 2.625″ W x 4.75″ H. It is made from cast iron and steel with a japanned finish. Japanning is not the same as paint or enamel but is a special type of lacquering finish (click here for more information). The Presses were then hand decorated with various flourishes that changed over time. Almost simultaneously with the release of the Single-Stroke Staple Press here in the U.S., McGill released the Eagle Staple Press No 1 in England. Aside from the painted decoration there was no difference between the models. Visit me at http://www.facebook.com/americanstationer and let’s talk about vintage office supplies and equipment. 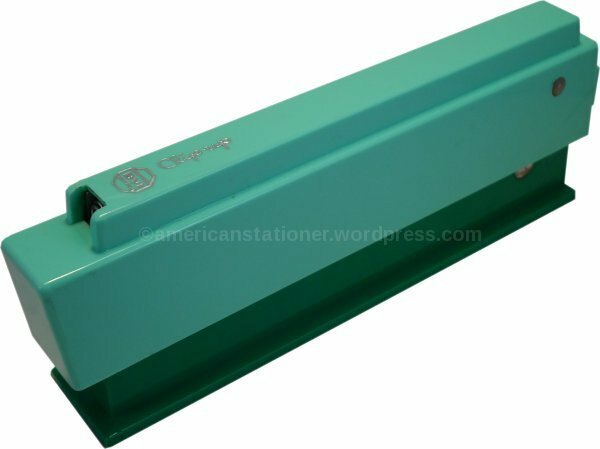 You can also support the American Stationer by getting my new, updated, 3d edition Hotchkiss Stapler ebook here at Amazon. For all of you old-skool collectors, get the new 3d edition softcover paperback of my book STAPLERS, STAPLING MACHINES, & PAPER FASTENERS VOL 1 – E.H. HOTCHKISS COMPANY OFFICE AND INDUSTRIAL STAPLING MACHINES here at Amazon. You’ll receive an excellent reference book and some good karma. And I’ll earn a buck or two (literally) which goes right back into supporting the research costs needed for the American Stationer. …”I started [collecting paper clips] about two weeks ago and I believe there are 57 varieties – not the pickle kind, either. Every time I get a new one I drop it into this little box. I have a clip, a double clip, a clipper clip and rinklip. I have a cross and a double cross and enough other kinds to form a clip menagerie. Wonderful where all these fool things come from! The end of the 19th and beginning of the 20th century saw a virtual explosion of new patents for the newest type of office item – the paper clip. It’s odd to think that an everyday item such as this was once a new and exciting addition to the office supply pantheon but it was. So, why did it take so long for the paperclip to be invented? This modest office supply could not exist until steel wire with the proper tensity was available along with the machinery to bend this wire into the various shapes used by the makers of these clips. It was this combination, along with a need for such an item, that made these a staple office item within a few years of their introduction. While the universally known “gem” clip is the undisputed king of paper clips, there were a surprisingly large number of other designs that have been produced over the years. One of the more successful clip variants manufactured was the Ring Paper Clip, or Rinklip. Rinklips were first sold by the Ring Paper Clip Company of Providence, Rhode Island. They were manufactured by the A.A. Weeks Manufacturing Company. It may not come as a surprise to learn that the president of the A.A. Weeks Manufacturing Co, Frank A. Weeks, was also the Treasurer of the Ring Paper Clip Company. Joshua B. Hale is listed on the patents as the inventor of the Rinklip. But not only did J.B. Hale invent the ring clip but also the machine to make them. Rinklips were first produced in 1905. At the time only one size and one design was advertised – the flat-topped ring clip. By December 1906 three sizes were available: little, commercial, and banker. This turned out to be a clever bit of marketing as all other paper clips used numbers to designate sizes (e.g. the No. 3 Gem Clip). Commercial Rinklips measured .625″ diameter while Banker Rinklips measured 1″ diameter. The Little Rinklip was approximately .4″ diameter. From 1921 onwards a numbering system was used to designate the different sizes. These ran from No. 0 to No. 4. Numbers 2,3, and 4 corresponded directly to the old system of little, commercial, and banker. Actually, it was common for the No. 4 clips to be called Banker Rinklips throughout its manufacturing history. There is a patent granted to George W. McGill in 1903, patent 731598, wherein he patents a clip design that is similar to the Rinklip. While the patent date is printed on boxes of Rinklips the actual patent number was not easily found nor was it known that there were two patents granted for Rinklips and one additional one for the method of producing them. The USPTO granted two patents to J.B. Hale and the Ring Paper Clip Company for the Rinklip. Furthermore, George W. McGill was not only a prodigious inventor but a practicing patent attorney and he had shown no reluctance to take people to court over actual and supposed patent infringements in the past – including A.A. Weeks. However, there is no evidence that he did so in this regard. The fact that two patents were granted and that G.W. McGill didn’t feel that the production of these clips warranted legal action on his part show that McGill should not be considered the inventor of the Rinklip. The patents for the Rinklip were extremely difficult to find and only recently discovered by me. The patent for G.W. McGill’s patent was very easily found and shows a very similar clip. Actually, a review of McGill’s patents from around that year will show that he patented virtually every known type of paper clip ever conceived. Even designs previously patented. The book “Adventures in Stationery” by James Ward on page 11 states that McGill patented and produced the Ring Clip. I believe it’s possible that McGill produced “a” ring clip, but is not the inventor or producer of the Rinklip. Ring paper clips were produced by other companies in later years. Both Oakville and Monarch were producing them in the 1960’s. They were widely available at least through the 1980’s and likely for decades beyond. However, they are essentially extinct today which is unfortunate since they are actually one of the better paper clip designs ever to be produced. To fasten paper using a ring clip you don’t insert the same way you would a gem clip. Ward, James. Adventures in Stationery: a Journey through Your Pencil Case. Profile Books, 2015. Visit me at http://www.facebook.com/americanstationer and let’s talk about vintage office equipment. You can also support the American Stationer by getting our eBook here at Amazon. If you needed to bind a group of papers together today you would likely either use a clip of some kind (e.g. a paper clip or maybe a binder clip) or you would staple them together. It’s unlikely you would consider any other method. However, in the early 20th century your choices were much more diverse. You might consider a dot of glue/mucilage on each page, a rubber band, a brass McGill paper fastener, a stapler, a paper clip of some kind, needle and thread, an eyelet, or maybe a metal pin. All of these methods were used and it was mostly personal preference or office policy that determined which a person would use. Perhaps surprisingly, one of the most used methods for fastening papers was with a pin. You would simply fold or pinch the papers a bit and push a pin through them. The most frequently used type of pin was a common pin but wedge, or bank, pins were just as popular. There were a number of machines introduced in the late 19th and early 20th centuries to cater to individuals and offices that still used pins. One of the earliest was the Pin Stapling Tool, first advertised in 1896, which took a common pin, cut off the ends, bent it into a staple shape, and then inserted the newly-created staple into the papers. At the turn of the century a very similar machine, the Century Stapling Machine, performed a very similar function. However, these machines (and others like them) essentially took pins and turned them into staples. In 1926 a machine was introduced that took wedge pins and essentially just automated the process of inserting them into papers. This new machine was the Pinzit. Measuring 7″ L x 2.375″ W x 5.5″ H and weighing 1 lb 14 ounces this is a substantial machine. It was nickel-plated and made of steel and another non-ferrous metal, probably aluminum. It had a felt-covered bottom that kept it from marking furniture. It used glued-together wedge pins in strips of 25 that were loaded into a magazine which, according to ads, could hold 75 pins. I have been able to load 100 pins in the machines I have though. While the Pinzit was envisioned mainly as a paper fastener as evidenced by the patent, it seems to have been used just as much in the clothing industry. This is likely why it was successful enough to keep being manufactured for as long as it was. The Pinzit was first advertised in 1926 and the last known reference is an ad from 1939. It was offered for $8.50 in 1929. In 2017 dollars that equates to $122. I’ve listed after each company name a year in which I have found a specific third-party reference. My opinion about these companies is that the Pinzit Company, Pinzit Sales Corp., and any other company name with Pinzit (for example there was a Pinzit Company of New England) was simply a sales organization while Universal Pin Co or Universal Pin Corp were the manufacturers. It is my further opinion that the Pinzit was first manufactured by the Universal Pin Company which then sometime in the early 1940’s became Universal Pin Corporation and then reverted back to Universal Pin Company sometime after World War 2. Again, this is speculation but reasonable given the information available. To Curtis Scaglione for sharing photos of items in his collection. Curtis runs his own website, MyStaplers at www.mystaplers.com. Go ahead and give him a visit (warning: music autoplay). Back in 1866, George W. McGill patented what is now one of the most basic of office supplies, the brass paper fastener. It was revolutionary at the time as it fundamentally changed how papers were organized and held together. They were safe, easy to use, and unpretentiously decorative. McGill quickly realized though that one issue with using these is that you first needed to create a hole or slit in which to insert the brass fastener. Over the years he patented several different presses to perform this function but mostly they were large and heavy. But what could you do if you had mostly smaller jobs that didn’t really require the use of a two and a half pound solid cast iron press? That’s where the McGill Paper Fastener Punch came in. Weighing 1.5 ounces, the McGill Paper Fastener Punch was 3.125″ L, 0.875″ W x 1.5″ H. So it was very small and light. The body was made of brass, the spike of steel and the top knob was made of plated steel. This made the Punch very strong. It was also relatively inexpensive. But the most compelling feature of the Punch was that it just plain worked. This combination of small, light, strong, cheap, and good design was a winning combination that made this a successfully selling item for over 40 years. The Fastener Punch was patented on May 26, 1874 to George McGill. He was granted patent number 151236 for his invention. I can find sources that show the Fastener Punch being sold from at least 1879 through 1921. However, it is very likely that this was available from around 1874 through to approximately 1930. 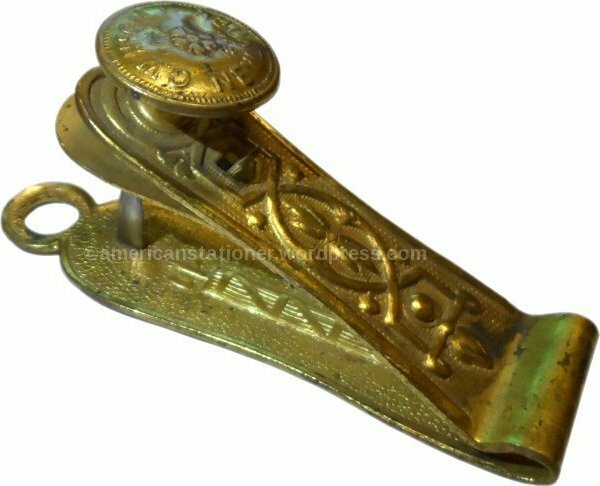 The McGill Fastener Punch was also highly decorative with raised scrollwork and flowers on the top piece and a fasces imprinted on the bottom piece. The fasces is an old Roman symbol denoting unity and order which is certainly a duty performed by the Fastener Punch. The punch is marked “G.W. MCGILL NEW YORK” on the top of the knob. In 1876 George McGill entered into a 20 year contract with Holmes, Booth & Haydens for the manufacture of his fasteners. I have seen ads showing that with the purchase of certain fastener sets you received a McGill Fastener Punch for free. As Holmes, Booth & Haydens was one of the largest brass-works in the world, and as the Fastener Punch is made primarily of brass, it makes sense that these would also have been manufactured by Holmes, Booth & Haydens. The business of manufacturing McGill’s fasteners was exceedingly profitable to both McGill and to Holmes, Booth & Haydens. McGill was made a director in this corporation and the fastener business became a separate department under his control. McGill had an office at the New York City office of Holmes, Booth & Haydens where he directed the fastener business and oversaw the manufacturing of them. George W. McGill was also a patent attorney. In about 1899 George McGill brought a lawsuit to bear against Holmes, Booth & Haydens for not honoring the payment terms of their contract. McGill did win this lawsuit but it seems to have been the end of their business relationship. In January 1899 the McGill Fastener Company was incorporated in New York. On October 17, 1901, Holmes, Booth & Haydens merged with several other brass-works in Connecticut to form the American Brass Company. Taken together it appears that anything manufactured after 1899 would have been made by the McGill Fastener Company while anything manufactured before 1899 would have been made by Holmes, Booth & Haydens. A comparison of this same Paper Fastener Punch against the original patent will show some obvious design changes to the punch. However, I do not know when this design change was made. George Warrington McGill was born in Lancaster, Ohio on March 9, 1844. He started out as a civil engineer, then a lawyer, and finally an inventor and businessman. He was married to Mary Peebles Harry and they had one child, a son, named W. Harry McGill. George W. McGill died September 30, 1917. There is a reason why items such as scissors, staplers, hole punches and tape dispensers are widely used and available over a century (or much longer as in the case of scissors) after their invention. It’s because they are just as practical, needed and useful as when they were introduced. There are also reasons why some items were only produced for a very short time and you are unlikely to have ever heard of them. While you can literally go to any kind of store and buy a stapler you’d be hard-pressed to find anything on sale today that dispenses paper clips one at a time. This item falls under that second category above. The Clip-Up is simply a cartridge-loaded paper clip dispenser that dispenses gem clips one at a time. I consider myself a very organized person but on the office organization scale of obsessiveness this little beauty falls on the extreme end. This was manufactured by Burgess Vibrocrafters Inc. (BVI) in Grayslake, IL. It weighs 5.5 ounces empty and measures 7.25″ L x 1.25″ W x 2.375″ H. It was cartridge fed with each cartridge holding 100 paper clips. The bottom of the Clip-Up has “PATENT PENDING” stamped on it. However, it is my opinion that this item was eventually patented, although this patent was never assigned to BVI. If you look at patent 3170596 you’ll see that this matches almost perfectly with the Clip-Up. This patent was held by Curt E. Nyberg who is listed as the inventor. The application was made on July 12, 1960 and granted on February 23, 1965. That means that this particular Clip-Up must have been manufactured between July 1960 and February 1965. The overall style and colorization of this item, along with reasons listed below, lends support to that timeframe of manufacture. There has been one recent reference found in a popular magazine from March of 1964 for the Clip-Up. That means that it can be conclusively stated that the Clip-Up was available in 1964. Spectacle Neck Support (that strap for eyeglasses that connects to both temples/ear pieces so that they can hang around your neck) (2539922) – not exactly a collector’s item but still interesting. BVI specialized in the manufacture of various power tools, gardening and landscaping implements and electric home items such as can-openers and they held a large number of these types of patents. This is the only office-related item that I’ve found manufactured by them. It seems likely that this was not made for a very long time and was a poor-seller. The combination of it being a very niche type of office item coupled with the need for businesses to buy purpose built paper clip cartridges which were likely much more expensive than buying them loose in boxes probably was a combination that ensured poor sales. The timing of this does make sense to me though. In 1958 there was a fire at the BVI plant in Grayslake that forced them to relocate for about a year or so. They built a new plant in Grayslake which according to a 1959 article from the Antioch News was planned to be 85% larger than the previous plant. With all that extra capacity it makes sense that BVI would attempt to expand into other lines of business. Furthermore, for their fiscal year 1959 they saw a 75% increase in net sales so it sounds like they had the capital to invest in new areas. Burgess Vibrocrafters, Inc. was in business from at least 1950, which is when the first patents were assigned to BVI. It is possible that BVI was spun-off from a company called Burgess Battery Co. but I cannot confirm that. BVI’s name changed to Acme Burgess in 1980 and was purchased by Armatron in 1985 at which time BVI moved all operations out of Grayslake, IL. Editors, “BVI Sales, Profits Up Despite Fire”, Antioch News (Antioch, Illinois), May 14, 1959, page 10. Print. Correspondence with Grayslake Historical Society, Charlotte R., Archivist, re: Burgess Vibrocrafters, Inc., emails to Frank Parsons, October 22 to November 4, 2013. Special thanks to Charlotte at the Grayslake Historical Society for helping in my research and being patient with all my questions. It’s people such as her that makes researching any type of history even possible. Special thanks also to Roman Mudry out in Wisconsin. Roman contacted me through this website and now I have a second Clip-Up, an original box, instructions, and a blank cartridge to go with my full one. The empty cartridge oddly had some very handy information that confirmed much of what I had to date mostly just suspected about the Clip-Up.